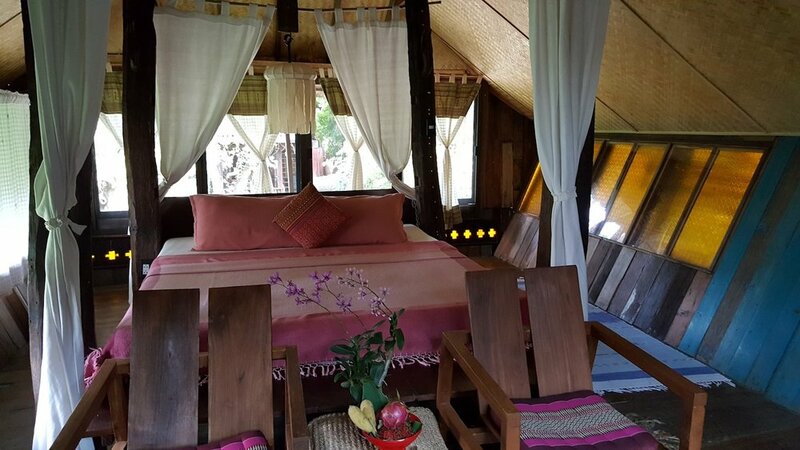 There’s a lot going on in and around CHIANG MAI, so depending on the ages and interests of your children, you could spend your second day here on a cookery course, practicing Thai boxing, hiking up to a golden temple or trekking through hill-tribe villages. Chiang Mai is renowned for its fantastic curries, so this is a great place for your kids to find out how to cook them for themselves. On an insightful half-day THAI COOKERY COURSE with Asia Scenic, you’ll shop for ingredients at a local market, learn how to grind curry paste and fold spring rolls, and pick up the finer arts of cooking pad thai or Khao Soi curry, the spicy, creamy noodle soup synonymous with Northern Thailand. The best bit, though, is that you get to eat everything you’ve cooked.. The course costs ฿800 per person, but it can work out well if a child cooks and an accompanying parent helps supervise (฿200 extra). In the afternoon, you could try your hand at MUAY THAI, the national sport of kickboxing, with a lesson at the Chiangmai Muay Thai Gym on Wiang Keaw Road in the northwest corner of the Old City. Thai children start learning Muay Thai at the age of 7, but the drop-in classes might appeal more to teenagers, as they cover several basic moves and techniques and it’s quite a work out. Afternoon classes start on the hour between 2pm and 6pm and last around 2 hours (฿390); just turn up 15 minutes before the start. If you’d prefer to take in some quieter culture instead, you could spend the afternoon at WAT PHRA THAT DOI SUTHEP [daily 6am–6pm | ฿30], Northern Thailand’s holiest shrine, which crowns the mountain west of Chiang Mai. It’s about an hour’s ride out of town, the road winding up Doi Suthep until you reach the temple’s car park, from where you can either ride the cable car up to the temple itself [฿50, including the entry fee] or tackle the stairs – all 305 of them. This is a lovely time to be up here, the temple’s golden chedis and statues glowing in the late afternoon sun, and the views down over Chiang Mai should be clearer now that the worst of the day’s heat has gone. It costs around ฿650 to charter a songthaew for the trip, depending on your bargaining skills, or ฿750 for a car and driver through your guesthouse. Sarongs are available at the temple if you’re not dressed appropriately. With older children, an alternative itinerary for today will see you TREKKING between hill-tribe villages in the dramatic countryside surrounding Chiang Mai, a day-trip that many families find is one of the cultural highlights of their trip to Thailand. CHIANG DAO, 70km north of Chiang Mai, is a good focus, as its spectacular mountains are home to a variety of different hill tribes and the trekking isn’t too strenuous. Green Trails has over 25 years’ experience running ethically responsible treks with English-speaking guides that know and understand the tribes they work with. On one of their recommended day-trips, you’ll visit the Palong, Lisu and Akha tribes, hiking from village to village and learning about their animist beliefs and the way they continue to use the forest around them for food, herbal medicine and natural dyes. A standard tour costs ฿2000 per person for a family of four but can be easily customised to include different villages and/or activities, such as bamboo rafting on the Mae Taeng river. You’ll make a great impression on the locals if you can learn a phrase or two before you go – “Hello” is “Jaw sa daw mia lo” in Akha and “Saatoo” in Palong (the Lisu don’t use it in their language; nor do they say goodbye). TOP TIP If you’re going to go hill-tribe trekking, make your impact a positive one by doing some due diligence on the operator you’ll be trekking with, making sure that they run culturally sensitive programmes, have a long-term relationship with the communities they visit and understand (and care about) hill-tribe culture and the etiquette involved in village visits.